Cruise to the city of Coventry. The old Coventry Cathedral was destroyed during World War 2, but the new cathedral was completed in 1962, and is worth a visit. The Museum of British Transport is south of the canal basin, and claims to be the largest collection of British made transport in the world, with over 200 cars, 90 motorbikes, and 230 cycles, also period street scenes, royal vehicles and the awesome Thrust SSC -the world land-speed record holder. Turning left out of the marina, you head North, and soon you will encounter the short Newbold Tunnel. Newbold Quarry park is beside the canal, it is a local nature reserve, there are wildflowers, butterflies & birds and muntjac deer. It will take about 2.25 hours to reach here from the marina. 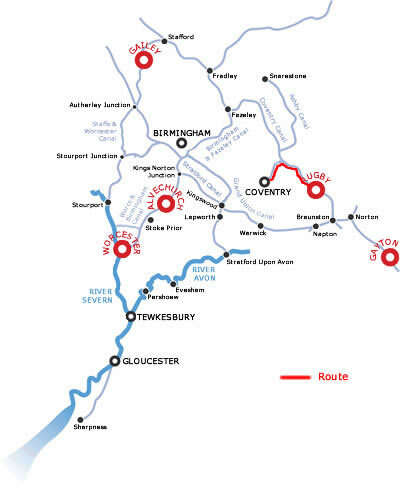 You will be turning a sharp left onto the Coventry canal towards the city. Just beyond bridge 2 before are 'Cash's Hundred Houses', an elegant row of weavers houses. The weavers slept on the 1st 2 floors, and the looms occupied the top floor. Only 37 of the houses remain. The end of the Canal at Coventry basin is very interesting on the side of a hill, overlooked by attractive wooden canal warehouses. The Old weighbridge office is now a shop and information centre. The basin is home to shops, small businesses and an art gallery and has a welcoming community of boaters. 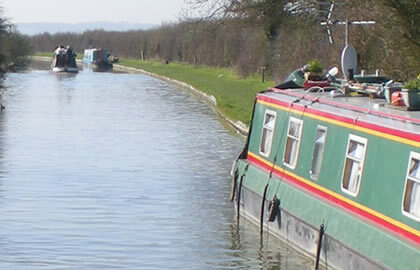 A canalside walk is ideal for spotting wildlife. A footbridge over the ring road gives access from the basin to the town centre, with shopping, eating and drinking possibilities. Coventry Art Gallery, the Museum of British Road Transport and Sir Basil Spence's remarkable Coventry Cathedral are also nearby. The old Coventry Cathedral was destroyed during World War 2, but the new cathedral was completed in 1962, and is worth a visit.